"Eventleaf has allowed us to quickly and accurately register our customers. The support team is prompt, efficient and reliable." "I have found the Eventleaf website to be a great help for registering people to my event. It's easy to manage and looks very professional." "Using Eventleaf for our event has been a lifesaver. The program is user friendly and takes a huge load off of us. We love it!" "Eventleaf is a great tool to manage large events. It is an elegant solution for complex tasks." "We have been using Eventleaf as our main event booking system and really what is there not to love?" "Eventleaf is suitable for all kinds of events. I highly recommend the software to everyone having an event." "Eventleaf is the most affordable, user-friendly online event registration system I have used. I recommend it to everyone." "On a scale of 5 stars, I would give Eventleaf a rating of 6! Our school uses it at training workshops and we love the product." "We use Eventleaf for our conference registration and check in. It is remarkable. Delegates are swiftly checked in without any queues." "Eventleaf has been a great resource for our customer events at AHEAD. It has provided a platform for us to accomplish successful events and keep our registrants well informed. The perfect amount of features for a great price!" "Eventleaf streamlined the registration process for our 3,000 teachers for our annual technology conference. Eventleaf surpassed our expectations in managing over 400 sessions! The app allowed our participants to register and manage their sessions allowing for a smooth and efficient experience." 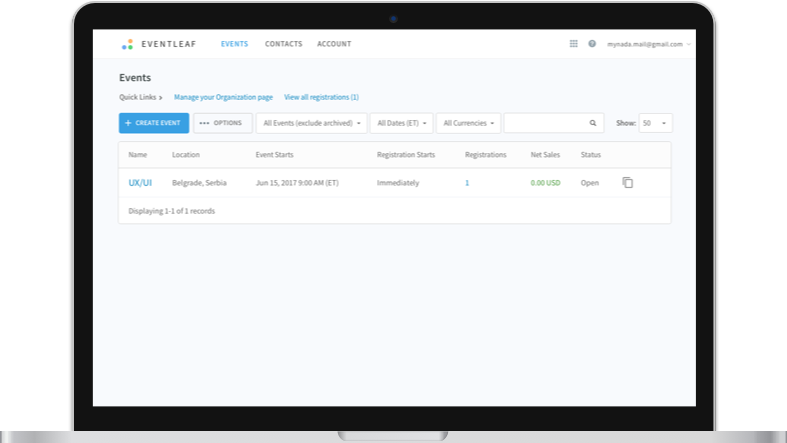 "We organize events with more than 10,000 registrations and Eventleaf is everything I have always wanted in an event management software!" "Eventleaf is the most effective way to handle registration, print badges with bar codes, and scan them to track attendance!" "At our event of over 600 participants, checking in with Eventleaf was so easy and we will definitely continue using it!" "I absolutely love Eventleaf. Eventleaf is very professional-looking event management software." Design your event registration page so that it makes a real impact. Eventleaf offers unmatched design flexibility that leverages the latest web technologies so your event page stands out from the pack. Once your event is published, send e-mail invitations and RSVPs to members, past attendees, prospects and other contacts. Create your own registration form to collect the information you need in the format that you want. Sell admission tickets, workshop packages, training courses, tours, meals and more. Set price levels, available quantities, discounts and ticket availability dates. Use the Check In app to check in attendees, collect payment and print event badges onsite. Use the Guide app to provide event information while increasing engagement with messaging and polling.